If you are reading this, you probably are a carnival glass collector. 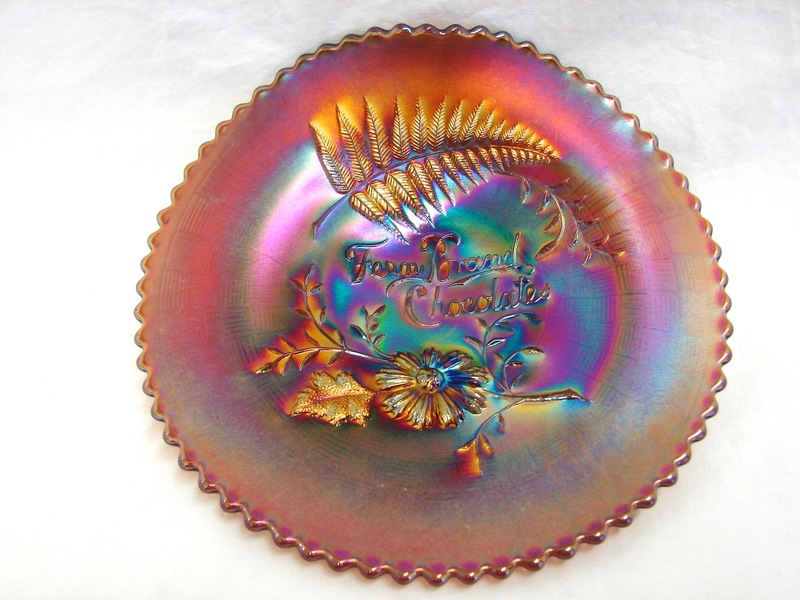 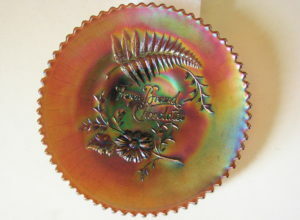 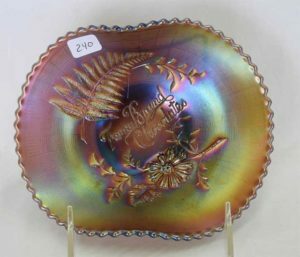 If you are a carnival glass collector, you might like collecting carnival glass advertising pieces. 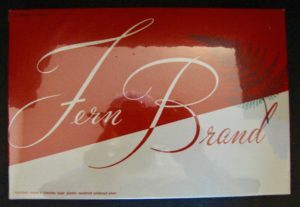 The Fern Brands Chocolates piece is unique because it is the only one that features fern fronds as a part of the design. In this article we are not only featuring the carnival pieces which include a plate, a handgrip plate, and a double handgrip plate, but are featuring pieces that came from the original candy making firm, Gardner and Gould, who were located in Burlington, Iowa. 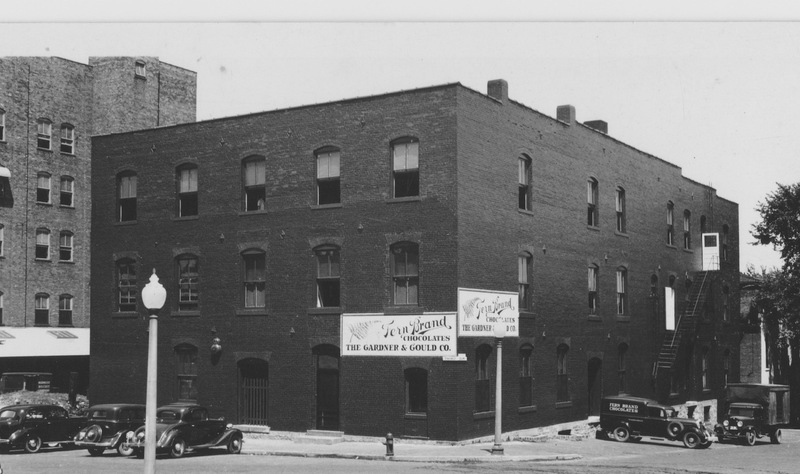 This was the Gardner and Gould, maker of Fern Brand Chocolates, building in a photo taken in 1939. 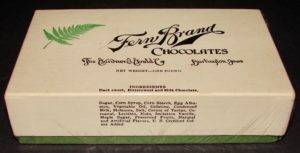 A close-up of the building revealed two Fern Brand Chocolates trucks. 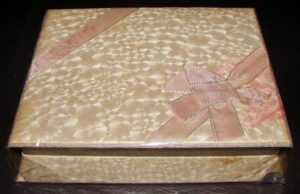 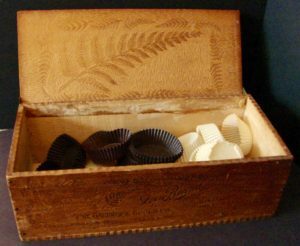 This wooden hinged candy box was intended to be used as a glove box once the candy had been eaten. 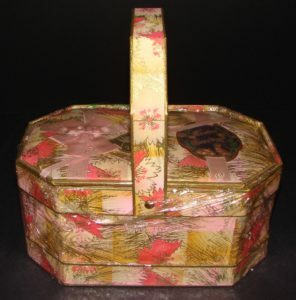 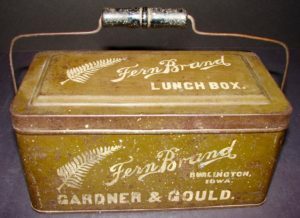 This metal Fern Brand Lunch Box would have been one of the earlier products that the company used for their chocolates. 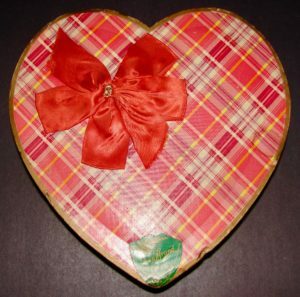 These two heart shaped boxes were used for that special someone on Valentine’s Day. 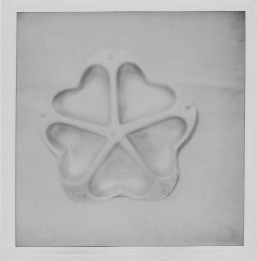 I would imagine that the one on the top was a bit earlier than the one below. 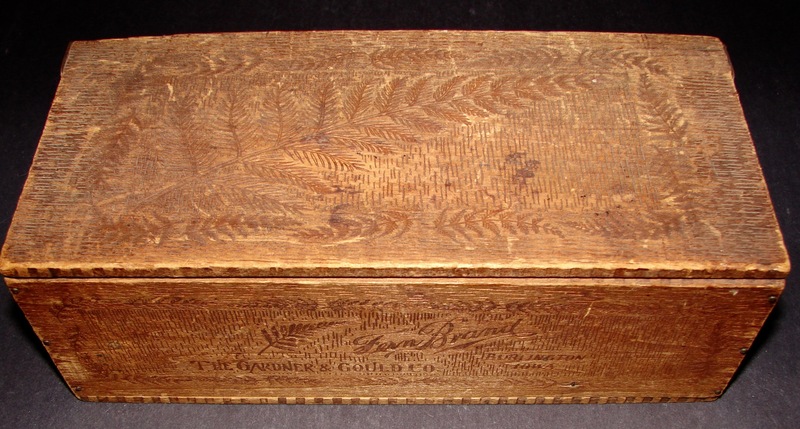 Easter boxes were another holiday box that was employed by the Gardner and Gould Company. 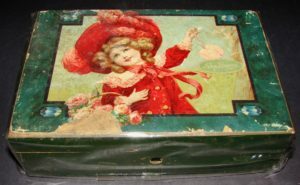 The box on the top featuring the beautiful girl appears to have a lock on it, so it was probably intended to be used as a jewelry box after the candy was finished. 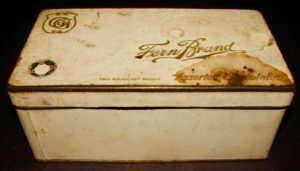 The box on the bottom is metal and fairly utilitarian. 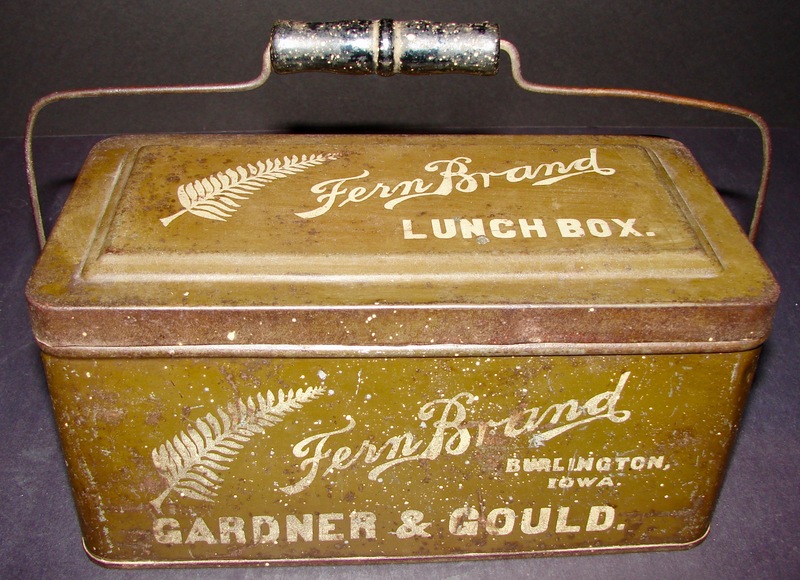 It could have been used for a lunch box without a handle. 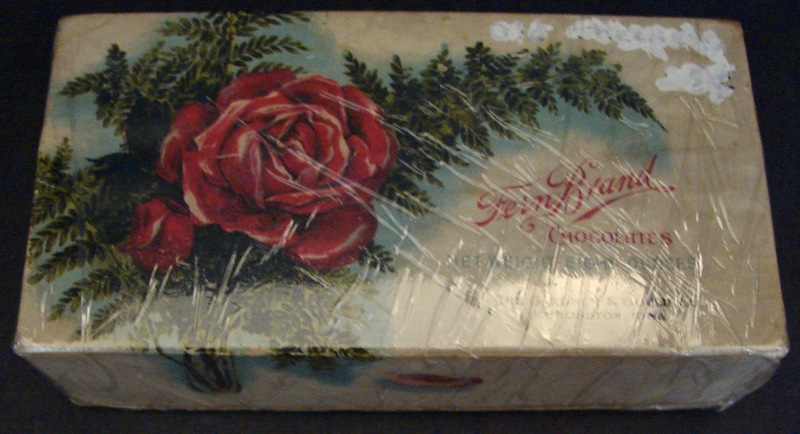 The two boxes above are still quite decorative. I’m sure the one on the bottom is older than the one on the left. These are what I call utilitarian boxes which feature different base colors, top to bottom: green, red, and orange. 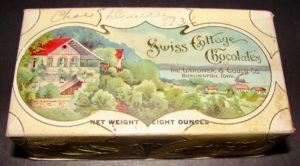 The box on the top top is a small chocolates box probably around the same era as the three utility boxes above. 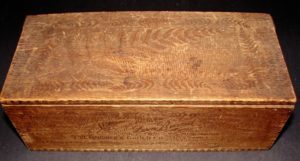 The box on the bottom is the most recent one that we feature. 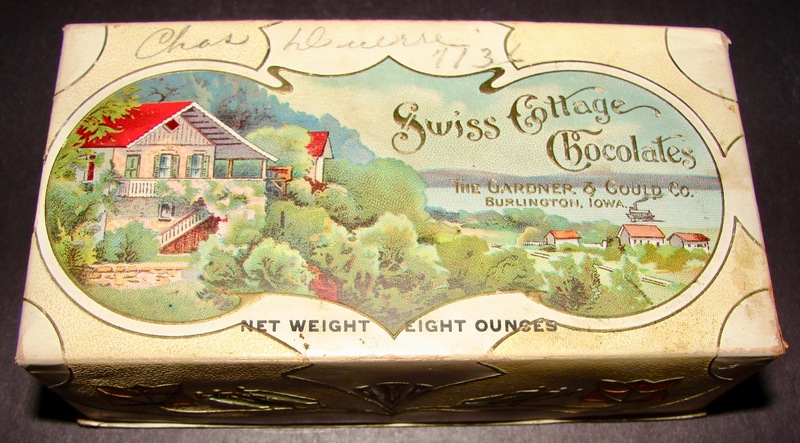 This Swiss Cottage Chocolates box did not feature Fern Brand Chocolates, but was also made by the Gardner and Gould Company. 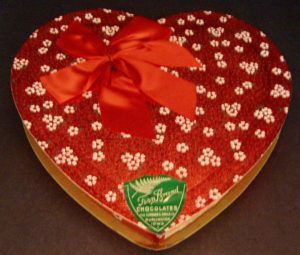 I would guess that the chocolates were very similar! 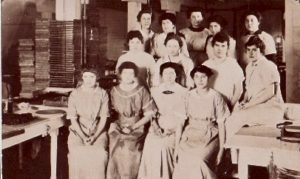 These were the workers in the early 1900’s. 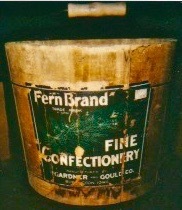 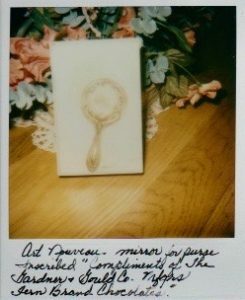 Other items that were related to the Gardner and Gould Company were the Art Nouveau mirror on the topand the Fine Confectionery bucket on the bottom. 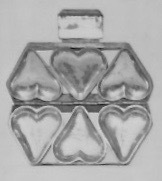 The hinged heart mold on the top was used to make three solid chocolate hearts, while the one on bottom was a five heart mold. When do you think these were used? 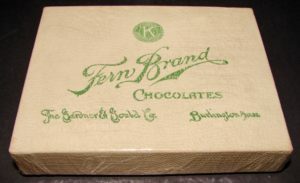 This is the wooden crate (box) that was filled with five pounds of chocolate and that delightful Fern Brand Chocolates plate. 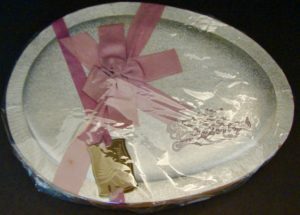 Don’t you wish you could have the plate and the candy?